In the past, outsiders saw China as a country where nothing ever changes. During the 1880s, an American named James Harrison Wilson wrote, “They have stood absolutely still in knowledge since the middle ages… The essence of their history can be told in a few short chapters.” Half a century later, in central China, another foreigner named Richard Dobson wrote, “There is no history in Honan.” Today, this seems an unlikely remark, because Henan province is known as the archives and the grave of the Shang dynasty. More than three thousand years ago, the Shang produced the earliest known writing in East Asia, inscribed into bones and shells — the oracle bones, as they are called in the West. If one defines history as written records, Henan is where it all began for China. 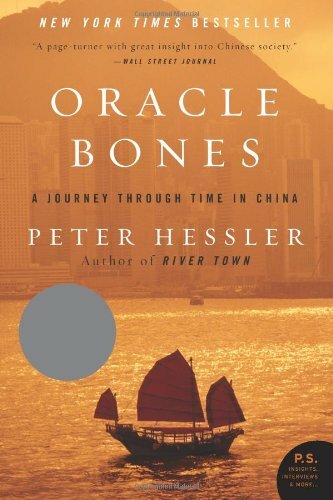 In Oracle Bones, Peter Hessler explores the tension between narrative and story, past and present, China and the West. Whereas his first book, River Town, focused on geography and sense of place, Oracle Bones is concerned with history and time. The book follows a small cast of characters through the years from 1999 to 2002, a period when China’s economy was growing rapidly and the country was engaging more deeply with the outside world. These events affect average Chinese citizens like Emily, a former student of Hessler’s who named herself after one of the Brontë sisters. In the south of China, Emily finds a job in the export industry, living and working in a semi-legal jewelry factory in Shenzhen, the “Overnight City” — a place without any past. To the east, another former student, William Jefferson Foster — he took his name in honor of President Clinton — struggles to rise from poverty as a migrant in the boomtowns of Zhejiang province. A third character, known as “Polat,” an intellectual and small-time trader who is a member of the Uighur minority, decides to emigrate illegally from Beijing to Washington, D.C., an experience that teaches him to view both China and the United States through the eyes of an outsider. His pseudonym means “steel” in his native tongue, and he chose the name because of the qualities that he believed to be necessary for any emigrant. It’s no coincidence that each of these figures has left home and re-named him or herself. In Oracle Bones, Hessler examines how average Chinese respond to the rapid changes at the turn of the century, creating new lives and identities. Along the way, Hessler records his own experiences as a foreign journalist, struggling to make sense of national events that range from NATO’s bombing of the Chinese embassy in Belgrade, to the protests of Falun Gong adherents, to the Chinese reaction to the events of 9/11. While researching in Henan, Hessler also stumbles onto the story of Chen Mengjia, a brilliant poet and oracle bone scholar who was hounded to suicide in 1966, at the beginning of the Cultural Revolution. In an attempt to understand what happened to Chen, Hessler interviews dozens of people across China, Taiwan, and the United States. Many are in their eighties and nineties, members of a generation that is rapidly disappearing, and Hessler hears about Chen from all perspectives — from colleagues, friends, and family members, but also from a former student who criticized Chen and from a scholar who had tried but failed to prevent the suicide. Along the way, Hessler meets dozens of archaeologists and scholars of ancient history, who introduce him to new ways of thinking about the creation of China and Chinese culture. Hessler learns that one of Chen Mengjia’s crimes was to defend the use of Chinese characters at a time when Mao Zedong came very close to replacing the traditional writing system with an alphabet. Chen’s story, and the story of China’s ancient past, is threaded throughout Oracle Bones, creating surprising connections with today’s nation of migrants and factories and boomtowns. Imre Galambos is a scholar of ancient Chinese, and he wrote his dissertation about the development of the writing system. His primary texts were two-thousand-year-old strips of bamboo that had been inscribed with characters. These were old texts, but new sources: most had been excavated during the latter part of the twentieth century. Some of these texts contradict the received versions of Chinese history, traditional viewpoints that have been accepted for millennia. One evening, I meet Galambos for a drink in Beijing, and the conversation turns to history. He explains that people have a natural tendency to choose certain figures and events, exaggerate their importance, and then incorporate them into narratives. We sit in a small anonymous bar near Houhai, a lake in central Beijing. This is one of the capital’s last intact old neighborhoods, and the bar’s windows open on to the lake. It’s a beautiful evening; the lights streak red and yellow across the nighttime water. Galambos talks about the power of perception, and then he points at me.